GEM has expertise in several research areas of engineering importance. GEM employs state-of-the-art commercial and in-house software in addition to advanced computational resources to solve the challenging problems presented by our commercial and DOD customers. 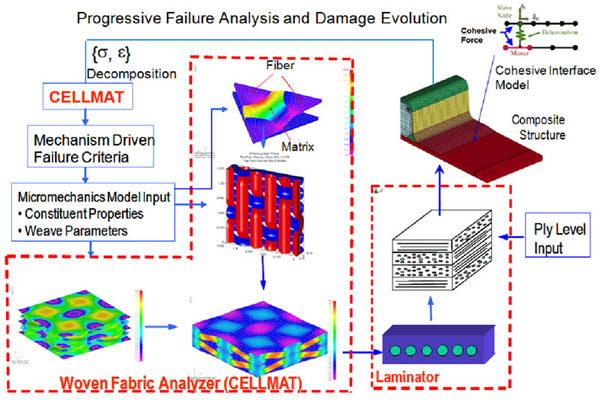 A multidisciplinary approach is used to evaluate the root of failure and residual strength of both metallic and composite structures subjected to either static or dynamic loading, fluid structure interaction, and parameter uncertainties. The wide spectrum of this subject area includes computational mechanics, fracture and damage mechanics, structural dynamics, stochastic mechanics, and material science. 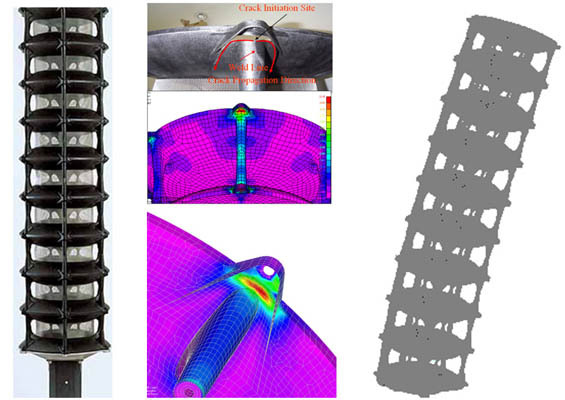 A detailed 3D finite element model has been developed for a full scale 9-cell siren subjected to a random wind load. A critical stress concentration zone has been identified along with the crack initiation and propagation path. Also, a probabilistic fracture analysis has been performed by integrating a peak load distribution, a response influence function, a damage accumulation model, and a failure criterion into a probabilistic analysis framework. The results of the probabilistic distribution in residual strength and life have been generated for the customers to enhance their existing risk informed design and fabrication practice. propagation at a ply or subcomponent interface is captured by a cohesive interface model. The resulting multi-scale computational framework in LS-DYNA has been established to bridge the response and failure predictions at constituent, ply, and laminated composite level. GEM has applied the developed hybrid damage prediction tool to a circular composite plate and a composite hat stiffener subjected to shock and low velocity impact loading respectively. The circular composite panel specimen uses the 24 ounce woven roving E-glass balanced weave with the vinyl ester resin. The plate is mounted between the steel mounting flange and the steel retaining ring. Given the applied boundary conditions, the dynamic pressure generated from a shock loading on the bottom surface is not uniform. A good agreement in dynamic response prediction has been observed from the comparison of time histories of strain prediction at two elements near the clamped edge with the corresponding strain gauge data. 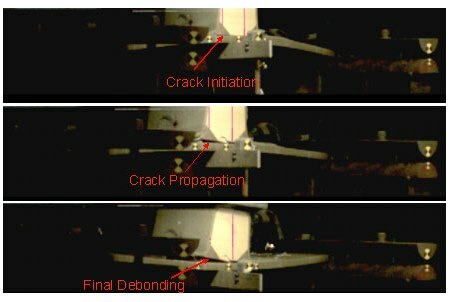 A comparison of predicted microcracking-induced debonding zone (interlaminar failure) is shown below. The size of the predicted damage zone matches well with the experimental observation. The second test case is associated with a composite hat stiffener subjected to a low velocity impact at its base plate. The composite hat stiffener is mounted on a shock table that is impacted by a hammer at a given drop height. To reduce the computational effort, a half-symmetry solid model shown in the figure is used for the low velocity impact analysis. 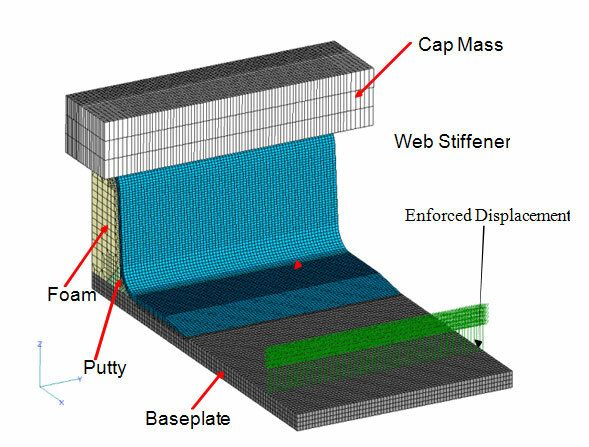 A cap mass with the same weight and dimensions as the one in the test setup is incorporated in the model analysis. Given the measured time history of the shock table motion after an impact, a prescribed displacement boundary condition is defined at the location of the half rounds clamper. The hat stiffener consists of 1) E-glass/vinyl ester woven fabric laminated plate (base plate); 2) web stiffener reinforcement (upper/side/lower/taper); 3) syntactic foam; and 4) structural putty. A crack is initiated at the tip of the putty from its outer edge. The crack then propagates in both directions, with faster growth toward the web taper. Because of the intensified stress field at the tip of the web taper, a second crack is initiated in the vicinity of the tip of the web taper from its corner. Coalescence of the 1st and the 2nd cracks results in complete debonding between the web taper and the base plate. Finally, the coalesced crack propagates towards the foam, resulting in complete unzipping along the interface. The predicted time of failure event, failure sequence, and the final rupture pattern agree well with the experimental observation. GEM’s scientists have developed a software toolkit for Abaqus (XSHELL) for fracture evaluation and load deflection prediction of welded metallic structures subjected to impulsive loading. The toolkit has the unique capability of predicting crack propagation path in a large scale thin-walled structure and the associated structural response such as the load-deflection curve. The XSHELL toolkit couples advanced element technology with widely used phenomenological material and failure models. In particular, to bridge the gap between the local plasticity induced damage initiation and ductile fracture at the structural level, innovative solution techniques have been developed to incorporate a length scale in the phenomenological model via a mesh size dependent calibration of failure parameters. Under SBIR funding, GEM has teamed with Prof. Yongming Liu at Clarkson University (CU) to implement a small-time scale and a modified two-parameter model within a concurrent fatigue analysis framework for Abaqus. 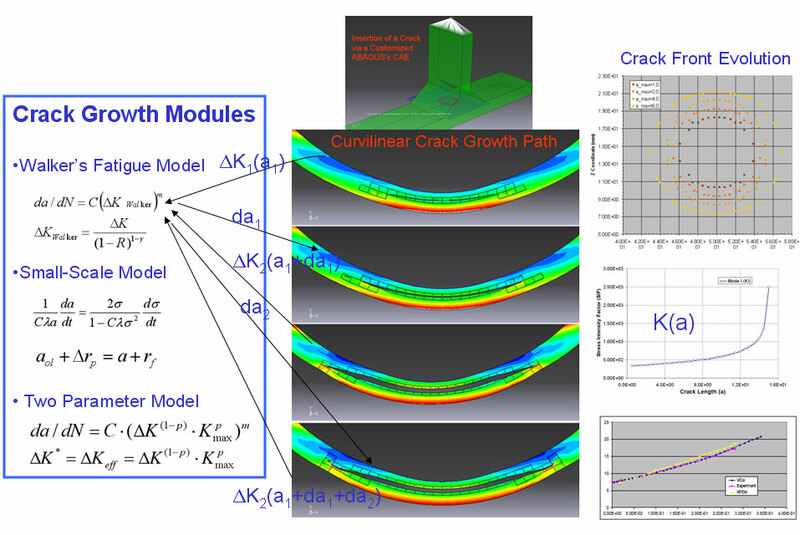 This tool couples our mesh independent crack growth module with CU’s small time scale model to capture a curvilinear crack growth in the presence of stress ratio dependent fatigue damage accumulation. Most of existing fatigue analysis methodologies are cycle-based in which the smallest time scale is one cycle. The cycle-based approach requires the cycle counting to transfer the true applied loading history to cycle history before the fatigue analysis can be performed. This requirement significantly limits the use of fatigue damage analysis to realistic applications. A new fatigue crack growth model based on a small time scale has shown its benefit in characterization of an arbitrary load history without invoking a cycle counting method. The model is based on an incremental crack growth at any time instant during a cycle and includes the stress-ratio effects based on a forward and reverse plastic zone interaction, which is the key driver for the crack closure under variable amplitude loading. A schematic representation of two crack fronts at t and t+dt is used to derive an incremental relation between da and dδ. The model only requires basic material mechanical properties to develop the shape and magnitude of the traditionally used da/dN~ΔK curve. Stress ratio and near-threshold crack growth behavior are included in the proposed model. 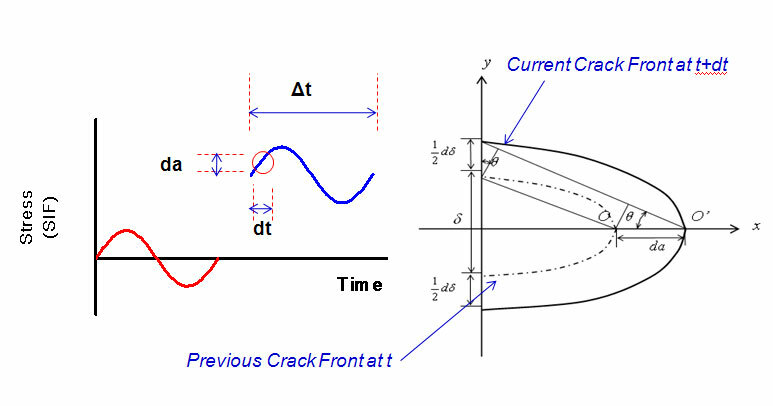 Given an explicit relation between the crack growth rate and stress rate, an accumulative fatigue crack length at a given t can be directly obtained from the direct time integration. 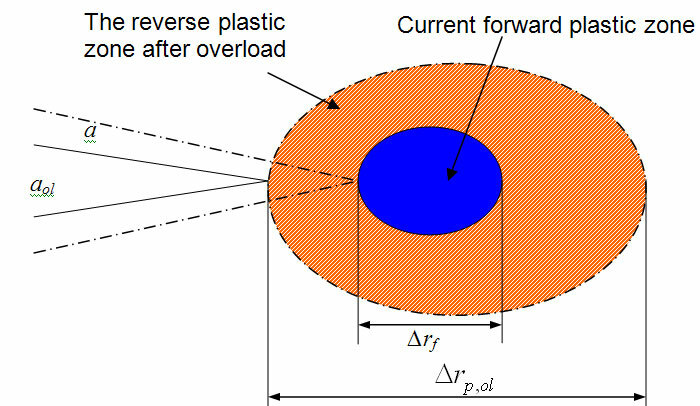 To include the plasticity induced crack closure under variable amplitude loading, a forward and reverse plastic zone model has been implemented to ensure that the current forward plastic zone has to go beyond the largest reverse plastic zone in order to grow the crack. 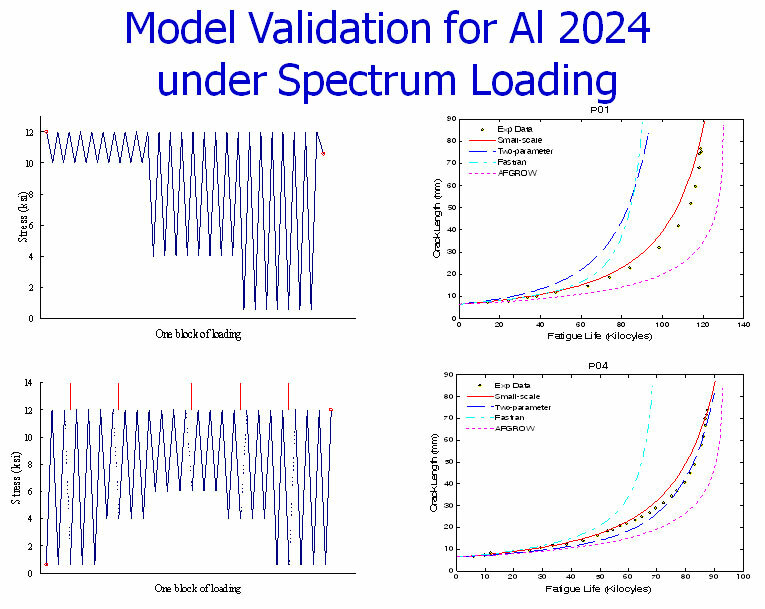 Experimental data on Al 2024-T3 plate specimens with center through crack under spectrum have been used to validate the implemented small time scale model. 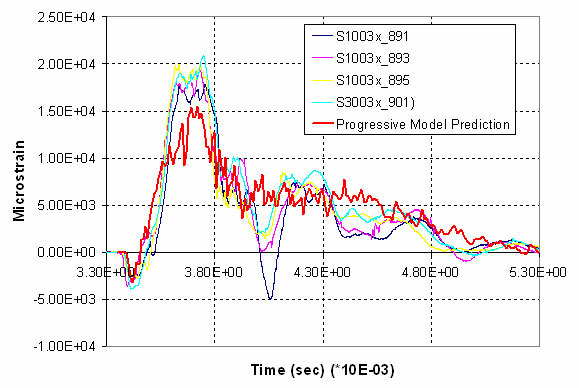 Predictions given by the two-parameter model, the small-scale model, AFGROW and FASTRAN code are also plotted together for comparative study. 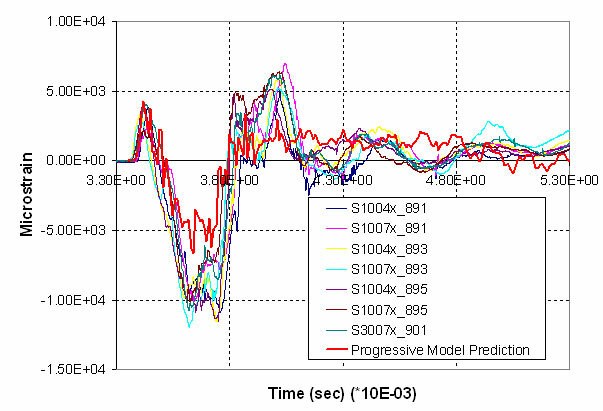 Generally, the predictions by the small-scale mode have a smaller mean value and variance of the error index than other model predictions under spectrum loading. The newly developed small time scale model has been integrated with our mesh independent fracture analyzer (XFEM) via a concurrent analysis framework. Three models have been included in our crack growth module: 1) Walker’s fatigue model; 2) a small-scale model; and 3) a two-parameter model. For a given initial crack configuration and number of cyclic loading cycles, the SIF is determined from the XFEM solver and used as the input for the crack growth module. The crack growth increment determined from the fatigue module is used as the input for the XFEM solver to calculate the SIF for a new crack configuration. This solution process continues until either a critical crack size or a fast rupture condition is reached. The output from this concurrent analysis includes the crack growth pattern, the K(a) prediction, and the a(N)curve. Modified compact test specimens have been fabricated by the Navy Lab to examine the curvilinear crack growth path and determine the a(N) curve for our model validation study. To facilitate the crack growth evaluation during the post examination, an overload is applied after every 50 cycles in an attempt to create a beach mark on the fatigue crack surface. By changing the location of the hole, either a “miss hole” or a “sink hole” crack growth pattern can be generated. Given the much shorter life of the sink hole model, numerical simulations have been performed for the miss hole specimen using the small-time scale model under various load cases. 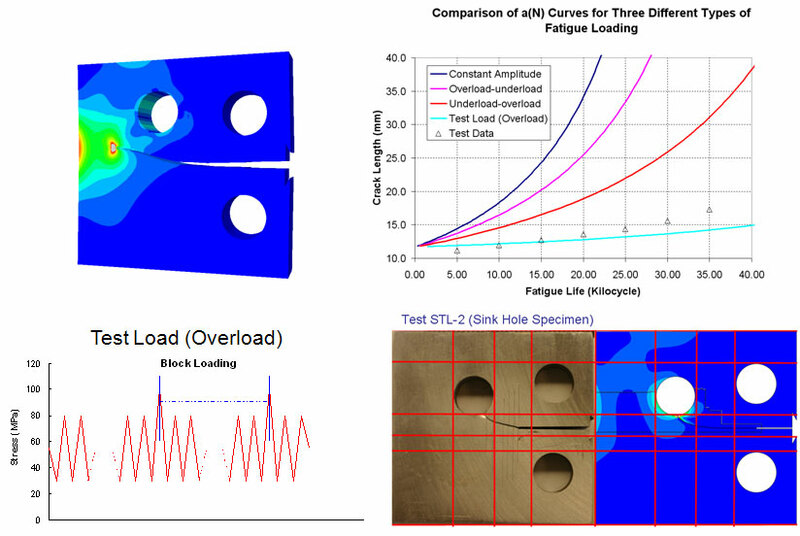 In addition to the real test load (overload), three additional variable amplitude loadings are used for the fatigue analysis. To validate our model prediction, the measured a(N) curve from the real test load is also plotted in the figure as the triangle symbol. Good agreement in a(N) can be observed from the comparison of the test data with the toolkit prediction using the test load (the light blue curve).